Theoretical physicist Stephen Hawking has died at age 76 from complications of amyotrophic lateral sclerosis (ALS). Famous for his mind-bending theories of black holes and his popular book, A Brief History of Time: From the Big Bang to Black Holes, Hawking was a frequent visitor to Caltech. He did much of his seminal research on black holes during a year-long visit to Caltech from 1974–75. Over the next four decades, Hawking, a professor at the University of Cambridge and a Sherman Fairchild Distinguished Scholar at Caltech, returned to the Institute often, carrying out research and exchanging ideas with faculty, postdoctoral scholars, and graduate students. "Stephen was not only one of the greatest scientists of our era; he was also a wonderful friend, and an inspiration to me, both personally and scientifically," says Kip S. Thorne (BS '62), Richard P. Feynman Professor of Theoretical Physics, Emeritus. "He lived life to the full. He took me to Antarctica in the depths of the Antarctic winter! His sense of humor was legendary. When he started a sentence, laboriously on his computer, I never knew whether it would end in a deep pearl of wisdom or an off-the-wall joke. His insights into our universe have inspired generations of physicists who follow in his wake, and will continue to inspire for decades to come. I miss him terribly, already." Hawking was born in Oxford, England, on January 8, 1942. He attended University College, Oxford, where he studied physics, and earned his PhD from Cambridge in 1965, in cosmology. Just shy of his 21st birthday, he was diagnosed with ALS, a neuromuscular wasting disease also known as Lou Gehrig's disease, and yet, despite an unfavorable prognosis, went on to live decades longer than expected. "Stephen Hawking was one of the world's greatest physicists, and his death is an enormous loss," says Sean Carroll, a colleague of Hawking's and a research professor of physics at Caltech. "He did more to advance our understanding of gravity than anyone since Albert Einstein. Stephen was also an irrepressible character who persevered in the face of overwhelming adversity. He traveled frequently, and could have gone anywhere; we were fortunate that he chose to frequently come to Caltech." Working with mathematician Roger Penrose in 1970, Hawking hit upon one of his biggest discoveries: that the theories of black holes—singularities or infinite curvatures in spacetime—implied that our universe began in a Big Bang. He later showed that black holes leak radiation, called Hawking radiation, and eventually explode slowly over eons—a milestone in scientists' struggle to unify gravity with quantum mechanics. He was also famous for declaring that information that fell into a black hole would be lost forever when the black hole ultimately evaporated, thereby violating fundamental laws of physics. 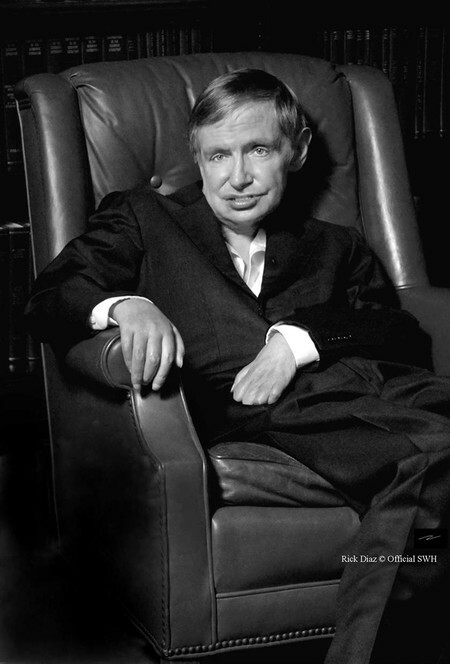 Hawking received numerous awards and honors, including the U.S. Presidential Medal of Freedom, the Copley Medal of the Royal Society, and the Breakthrough Prize in Fundamental Physics. He was named Commander of the Most Excellent Order of the British Empire in 1982, and was a fellow of Great Britain's Royal Society and a member of the National Academy of Sciences. Hawking was named the Lucasian Professor of Mathematics at the University of Cambridge in 1979. He retired in 2009, becoming the Dennis Stanton Avery and Sally Tsui Wong-Avery Director of Research in Cambridge's Department of Applied Mathematics and Theoretical Physics, a position he held until his death. Hawking was known for his scientific wagers, including a bet with Thorne and John P. Preskill, Richard P. Feynman Professor of Theoretical Physics at Caltech, regarding his declaration on the loss of information in a black hole. He eventually conceded that he had been wrong. In addition, he bet Thorne that the X-ray source called Cygnus X-1 was not a black hole; he lost. Preskill recalls, "What I'll remember best about my time with Stephen is that we could make each other laugh. I sensed when we first met that he would enjoy being treated irreverently. So, in the middle of a scientific discussion I could interject, 'And what makes you so sure of that, Mr. Know-It-All?' knowing that Stephen would respond with his eyes twinkling, 'Wanna bet?'" Hawking is survived by his three children—Lucy, Robert, and Tim—and three grandchildren.